English lantern clock by Henry Jones, London, ca. 1680-90. 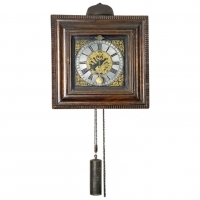 A fine seventeenth-century lantern clock with weights, 30 hour movement, verge escapement, rack striking hours and repeat, alarm mechanism. On the dial typically engraved floral and foliage decorations. Henry Jones in ye Temple, London (born 1634, died 1708) was an appreciated clockmaker for making good quality lantern- and bracket clocks. 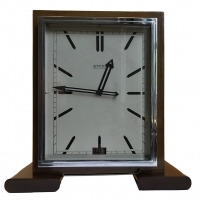 HxWxD 45x16x22cm.Clock is pictured in ‘English Lantern Clocks’ by White, George, page 211, figure IV/118.